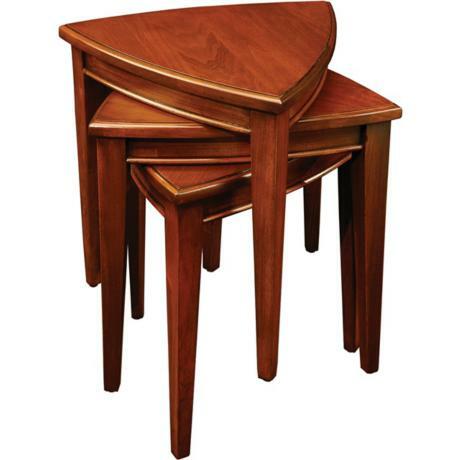 Convenient and handsome, these stacking tables are a perfect addition to any decor. Versatile, three-sided design nestles into corners and other tight spaces. Stacks in a small footprint when not in use. Attractive, bowed, beaded rails support a solid wood top. Hand applied multi-step glazed auburn finish allows the natural beauty of the wood to shine through. Glazed auburn finish. Solid birch wood construction. • Set of 3 tables. • Durable solid hardwood construction. • Beautiful hand applied multi-step glazed Auburn finish enhances the natural wood grain. • Versatile placement options to fit your needs and space. • Simple assembly is required. • Each table is 18" wide, 18" high, and 18" deep.